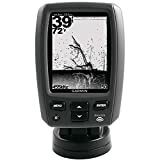 Unparalleled in this price range, the Garmin Echo 151dv serves as an accurate, user-friendly, inexpensive and a felicitous gadget that is ideal for anyone who wishes to have a successful fishing experience. Are you searching for a fish finder that caters to your fishing needs? Do you wish to own a durable and efficient tool to catch your prey effortlessly? Well, it can be a hectic and tiresome task, especially when you are new to fishing. Can you relate to the above-mentioned situations? If yes, then here is great news for you. A well-reputed brand named Garmin has launched a phenomenal tool that promises to make your life hassle-free. The Garmin Echo 151dv US and Canada with Transducer has all the suitable features that enable the users to cherish their time on water while catching fish wholeheartedly. The Garmin Echo 151dv fish finder is a great fishing tool on a budget. It possesses immaculate and easy to use features, including a 4-inch and an eight-level grayscale display having a resolution of160 x 256. It comes with two additional upgrade specs, DownVü (77/200 kHz dual beam) and 50/200 kHz dual frequency transducers. This model by Garmin has a maximum depth capacity of 1,600 feet with a power output of 200W RMS and 1,600W peak-to-peak (PTP). Subsequently, its narrow wide viewing cone makes it easier for the users to have a clearer view of underwater life that is far beyond the sides of their boats. Besides, its split screen feature enables you to observe the down view as well as the traditional sonar simultaneously in order to have unmatchable bottom tracking and target separation. Manufacturers of the Garmin Echo fish finder understand the needs of their customers. For both transom and trolling motors, the model comes with a mounting bracket that has a tilt and swivel mount capability so that the fisherman can get a coherent and comprehensive view of the targeted area. One of the important features of this model is the temperature identification of water, which plays a vital role in catching fish. Garmin Echo 151dv renders the user by displaying water surface temperate and allows them to place the boats according to the required temperature. All in all, budget friendly fish finder is certainly an advantageous and must-have tool for fishing lovers. It gives a clearer view of the underwater objects with a split screen feature that comes out as a plus. However, after turning it on, this device may take almost 2 to 3 minutes to start reading and tracking the depth. The Garmin transducer is quite durable and will not break in case its trolling motor hits something under water.